LONDON, 21 June 2016 – UK advertising is set to see the seventh successive year of recovery and the nation will remain one of the fastest-growing media markets in 2016 with +6.3% increase in spending taking the industry to a predicted investment of £17.3 billion, according to the latest media and marketing forecast figures from GroupM, the world’s leading media investment management group. 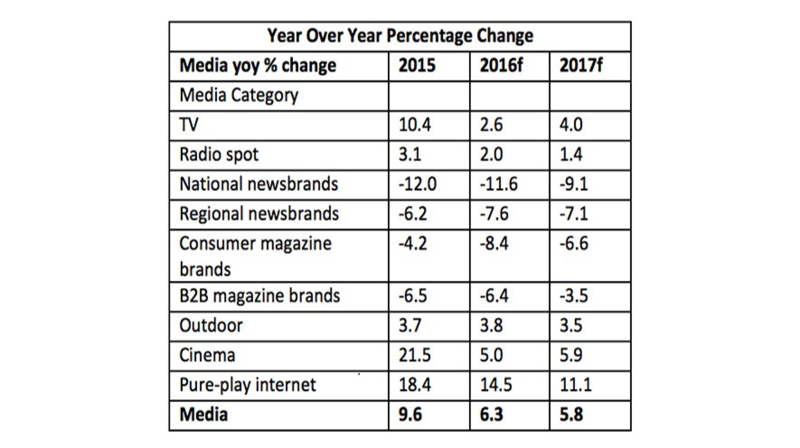 GroupM’s overall +6.3% forecast for 2016 is a small downward revision from the forecast of +7.2% made in November 2015, owing to a mild deterioration in consumer indicators (wage growth, job creation, consumer spending) and a small increase in aggregate risk (household debt surging; trade deficit growing) magnified by disruption from the European Union (EU) referendum. GroupM believes that a vote to remain in the EU would end uncertainty and be likely to yield a moderate ad investment acceleration in the second half of this year. In the short term, budget cuts and deferrals most noticeable in TV (including broadcaster VOD) have impacted the previous forecast of +7.4% falling to +2.6%. The forecast again highlights deterioration in print media where structural weakness persists and digital substitutes struggle to retrieve departing readers and advertisers. Digital advertising growth remains the principal contributor to investment growth for the third successive year with growth double the market average. Paid search began a surprising reacceleration in 2015 powered by the shift to mobile - and possibly YouTube video bought in AdWords and attributed to search. The research showed that 'core biddable' online display advertising investment including video across the main platforms is presently growing on the order of 50%. “Pure-Play Internet,” i.e. “Digital” minus digital TV and print ad investment repatriated back to their legacy media is forecast to occupy 50.8% of measured investment in 2016 (2015: 47.2%; 2009 30.9%). Pure-play digital including paid search has provided 88% of net incremental investment since 2009. UK media investment is already 13% larger in real terms since the historic peak in 2008 and 31% larger since the historic trough of 2009. GroupM's inaugural forecast for 2017 is for total UK media investment growth of 4.9% to include pure-play digital gaining a further two points of market share. GroupM’s forecasted distribution of advertising investment growth across media formats is detailed in the graph above.